24 Dec 2016-13 Jan 2017. From Don: I have to admit that I’m generally lazy when it comes to researching the history of the places that Alison and I visit all over the world. I usually prefer to go and see the sights first and then do the research afterwards. Much like Chance the Gardener in the movie Being There: I like to watch. So I knew next to nothing about the Olmec or the Maya before visiting some of the remains of their remarkable civilizations. The Olmec were the precursors of the later great civilizations of Mesoamerica, the Aztec and the Maya. The Olmec civilization dates from around 1200 BCE until about 400 BCE and very little is known about how it evolved, although there’s some speculation about extraterrestrials . . . . . . . 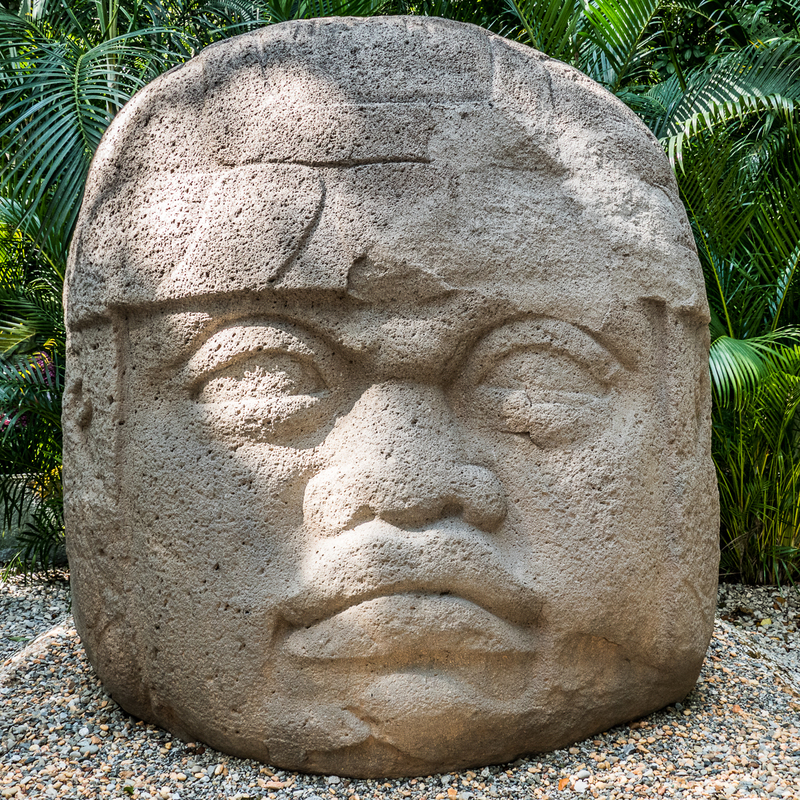 The Olmec invented the rubber ball game that was subsequently played by all the later Mesoamerican civilizations. They also invented the forerunner of the Mayan calendar. 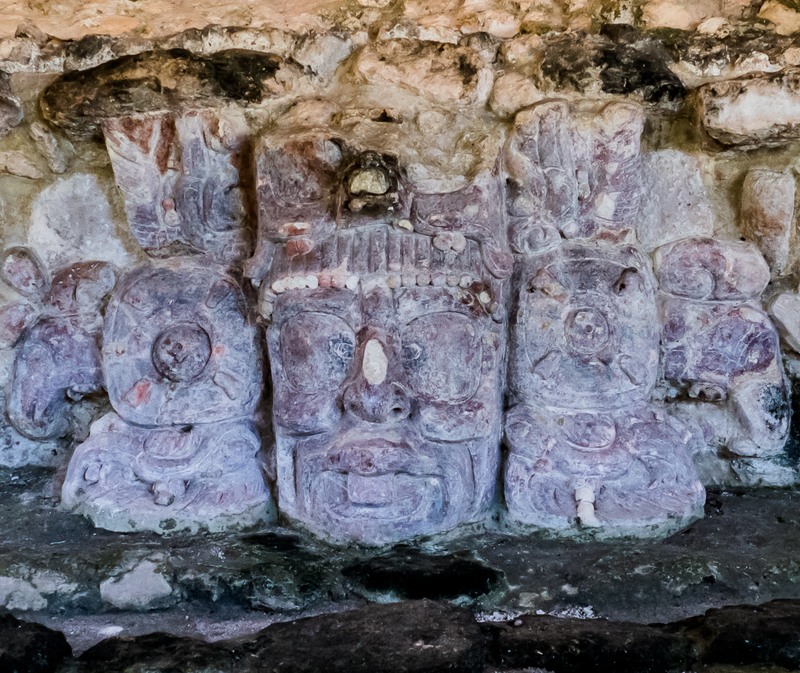 The great stone heads carved by Olmec artists are the best-known remnants of what was once a great civilization, and I’ve always wanted to see original examples of these heads. 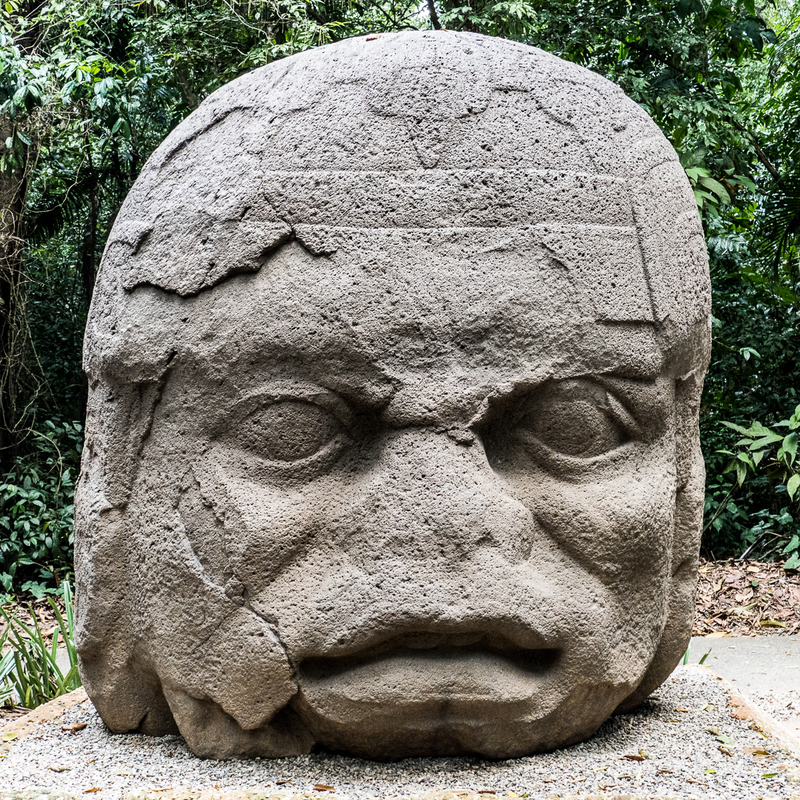 When I read that there was an outdoor museum in the city of Villahermosa dedicated to the art of the Olmec, Parque-Museo La Venta, we just had to visit it as we made our way around the Yucatan peninsula. There’s really no other good reason to visit Villahermosa. It’s a gritty dusty Mexican city with little else to recommend it. The twenty-eight carvings in the museum were moved from the Olmec city of La Venta after oil was discovered in the region. The heads are enormous, up to three meters (10 ft) high and weighing up to 25,000 kg (28 tons). They have a gravitas about them, despite their slightly crossed eyes, these being an inherited trait that can still be seen in some present-day inhabitants of the region: I saw a young man in the city of San Cristobal de Las Casas who could have been a model for one of the heads, right down to the slightly crossed eyes! 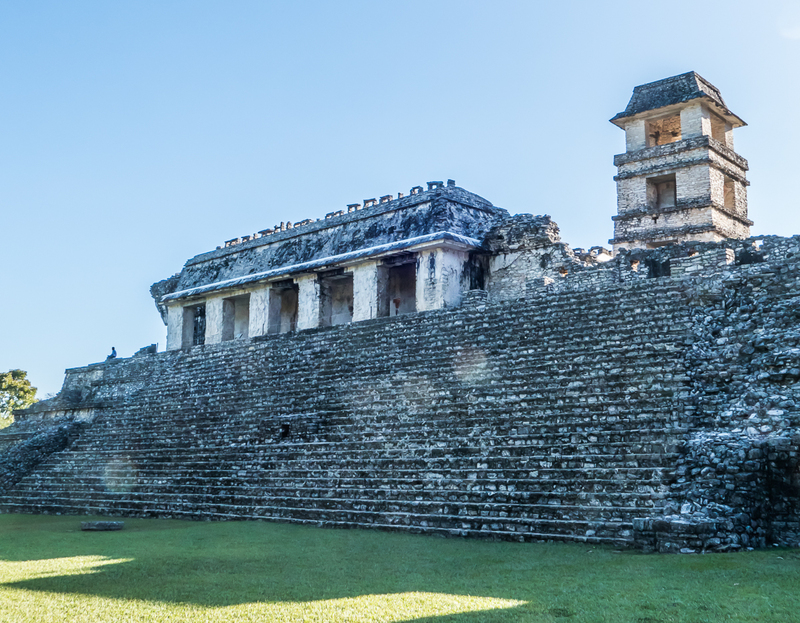 We visited four of the many ancient Mayan cities on the Yucatan peninsula: Ek’ Balam, Chichén Itzá, Edzna, and Palenque. Each of these cities has a magic all its own. 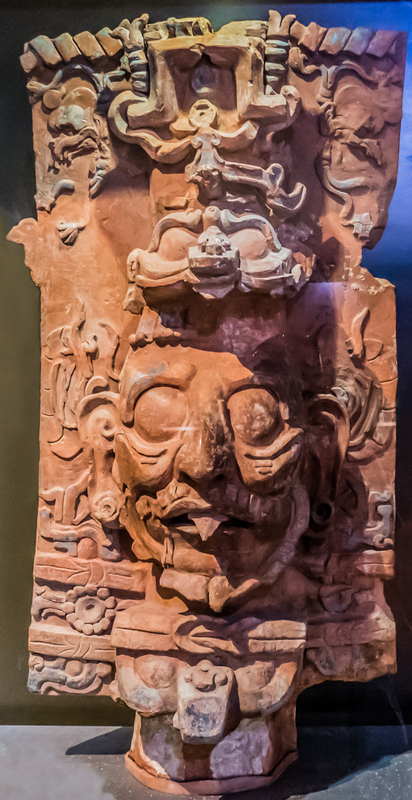 The Maya are the indigenous people who have continuously inhabited the lands now comprising southeastern Mexico, Guatemala, Belize, El Salvador, and Honduras. 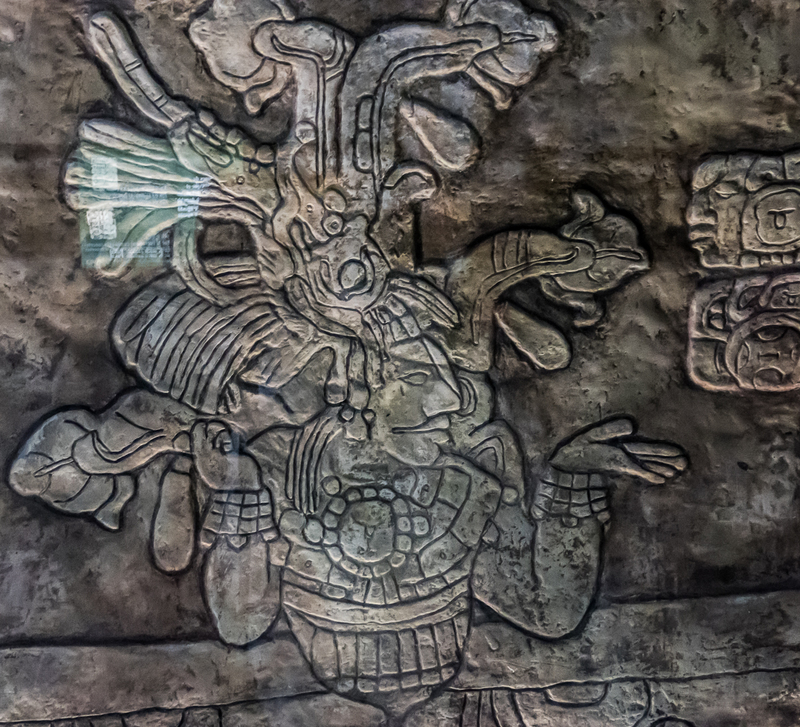 The ancient Maya civilization dates from around 1200 BCE to 950 CE. The Maya never had an empire in the way that the Romans, and the Inca had empires, with an all-powerful central government. 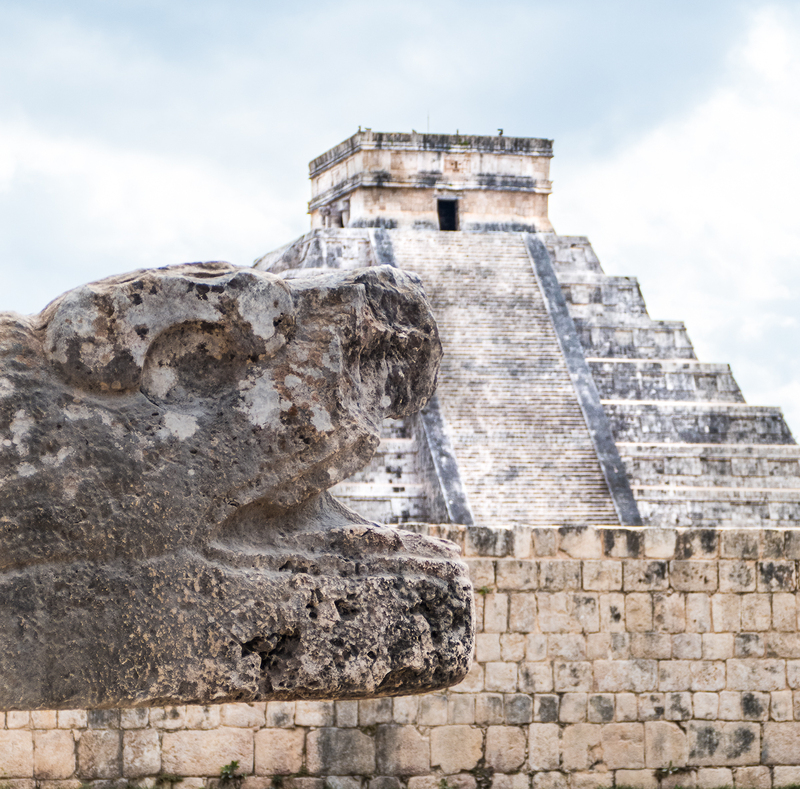 The Maya civilization consisted of various city-states that arose and fell in prominence over the centuries. The city-states had a complex trade network that connected them. They were also sometimes at war with each other. As these ancient cities were deserted, sometimes because of war, sometimes for unknown reasons, they gradually became overgrown. Those that we saw have only a small percentage of the buildings excavated. The rest have been lost to the jungle. 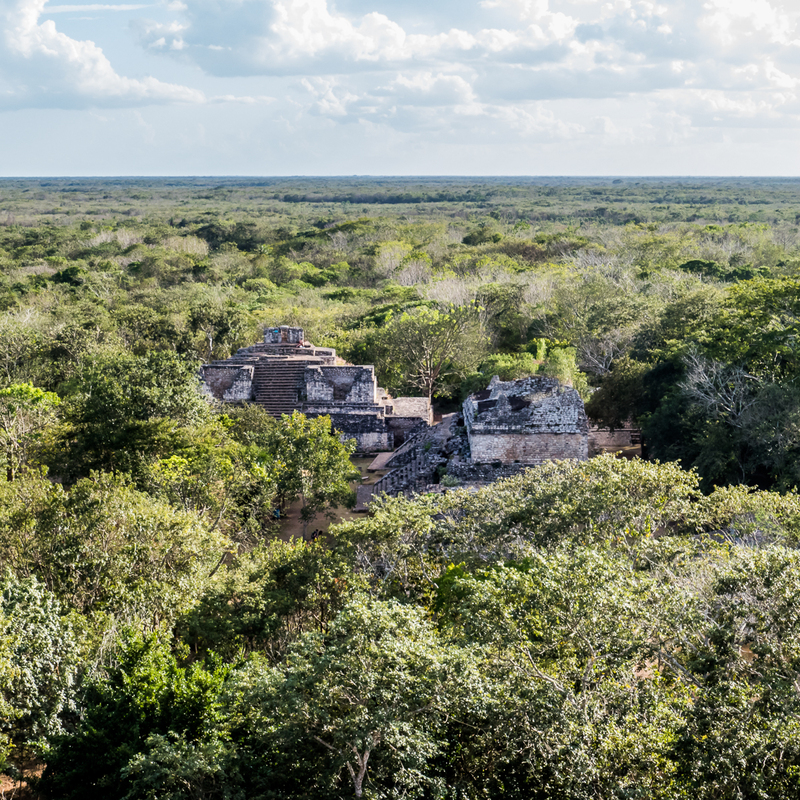 We went first to the little-visited Ek’ Balam, which is 25 kilometres (15 miles) north of the city of Valladolid. We decided to take a colectivo to the site, but finding one was a challenge. Both Lonely Planet and the tourist information office gave incorrect different locations, but we persevered, asking people on the street in our halting Spanish, and eventually we were directed to the right place. 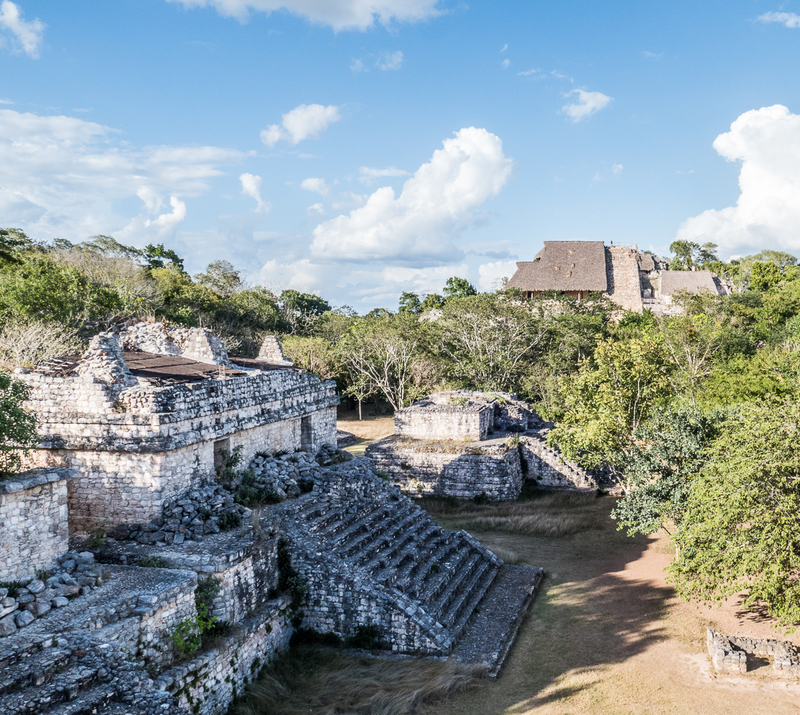 Ek’ Balam, the city of the “Dark Jaguar” was inhabited for more than 1000 years, from 100 BCE to 900 CE. 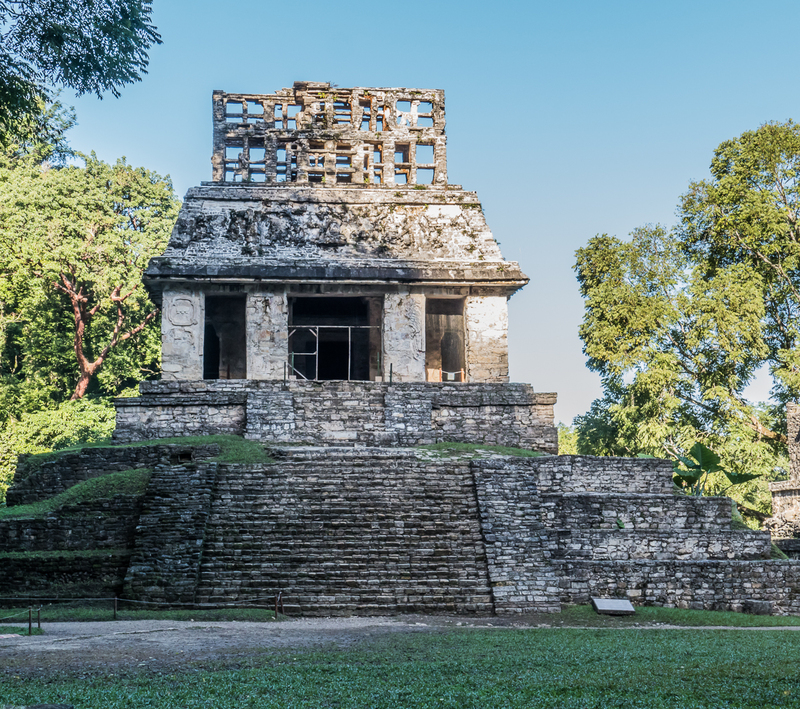 The tallest structure there, El Torre, contains the tomb of the city’s most powerful ruler, Ukit-Kan-Lek-Tok, along with some well-preserved carvings. From the top of El Torre we could see the other buildings almost engulfed by the jungle. More than a thousand years ago it was a thriving city covering about twelve square kilometres, and for about three hundred years, from 600-900 CE it was the largest regional centre. There is speculation that it was abandoned due to war. These days it’s a quiet peaceful place with few visitors. 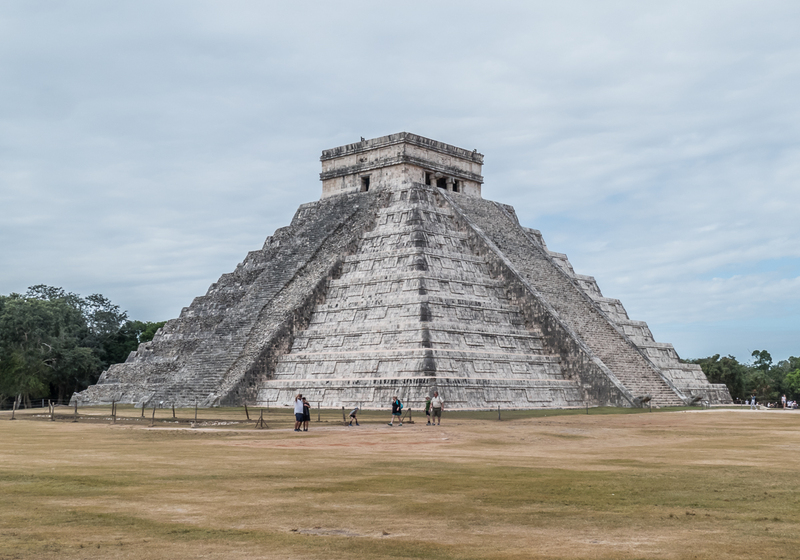 We knew we needed to get to Chichén Itzá early before the tour buses started arriving at around 11am. We were there by about eight, and when we were ready to leave at eleven the crowds had arrived. It was really worth the early start. and the “Church” with it’s intricate carvings, and images of Chaak, the rain god, represented as a toothless old man with sunken cheeks and a big curled nose. and many typical relief carvings. There’s a very large ball court at Chichén Itzá, the largest in Mesoamerica. The game, called Poc-a-Toc, was played with a small rubber ball. The goal of the game was to get the ball through one of the large stone rings attached to the walls on each side of the court. The rings are at a height of seven metres (23 ft). Players were not permitted to touch the ball with their hands or feet, so a game could go on for hours before a winning goal was scored. One legend has it that the captain of the winning team would present himself to the captain of the losing team who would then behead him! Apparently this was the fast track way to Mayan heaven. Makes me wonder just how many teams threw the game in order to save their necks. 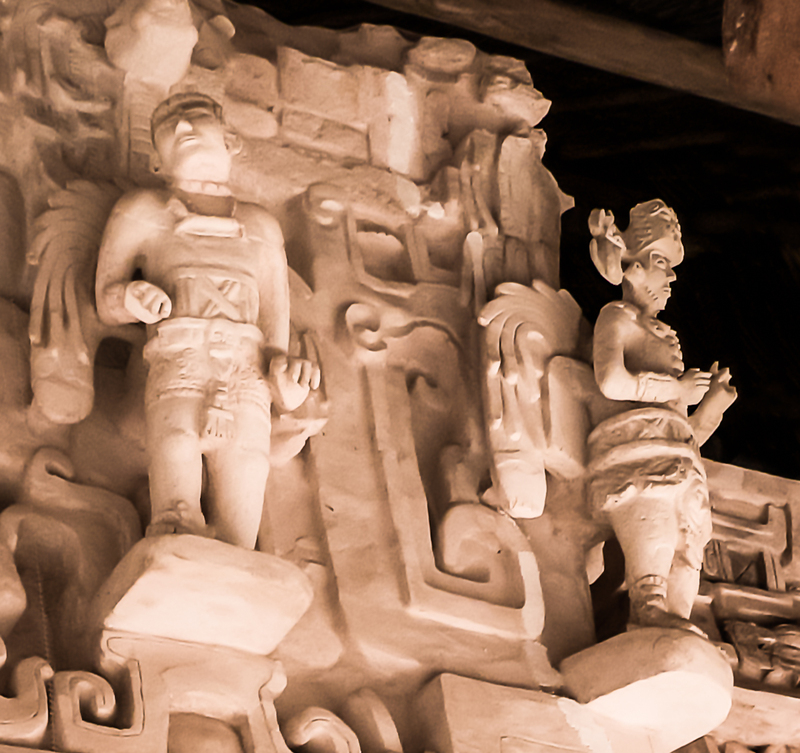 There are however, relief carvings showing teams facing each other and the captain of the winning team decapitating the captain of the losing team. Either way it was not a game to be taken lightly. 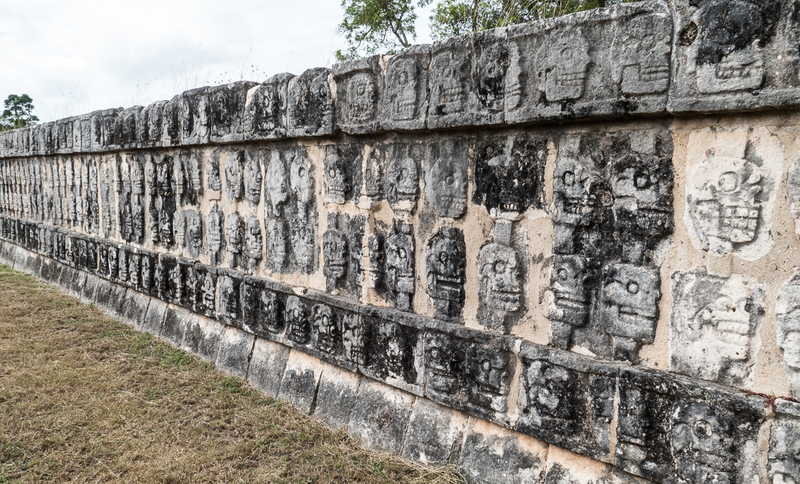 There’s a long wall of carved bas-relief skulls known as Tzompantli near the ball court, which is thought to be the base of a sacrificial platform on which the heads of the executed were displayed. Edzna is another of the less well-known sites, and once again we pretty much had the place to ourselves. It was inhabited from even earlier than 400 BCE, and by 200 BCE it had developed into a major city. 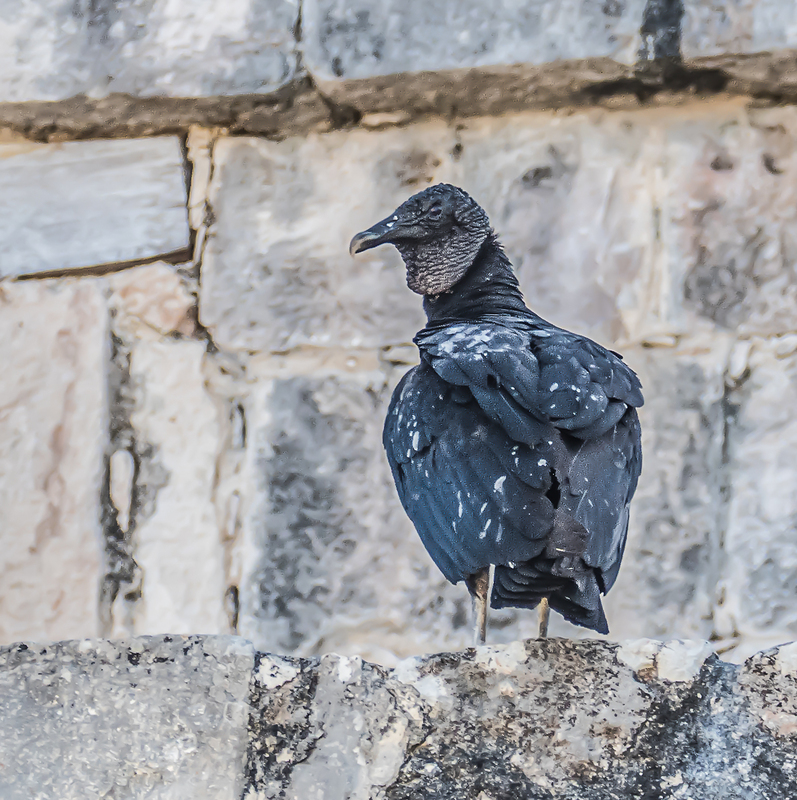 The Pyramid of Five Stories (El Pirámide de los Cinco Pisos), a temple built on a platform forty metres (130 ft) high, is the most outstanding structure, now empty and silent except for numerous vultures. Low to the ground in one of the other structures are large relief carvings again showing gods with crossed eyes. 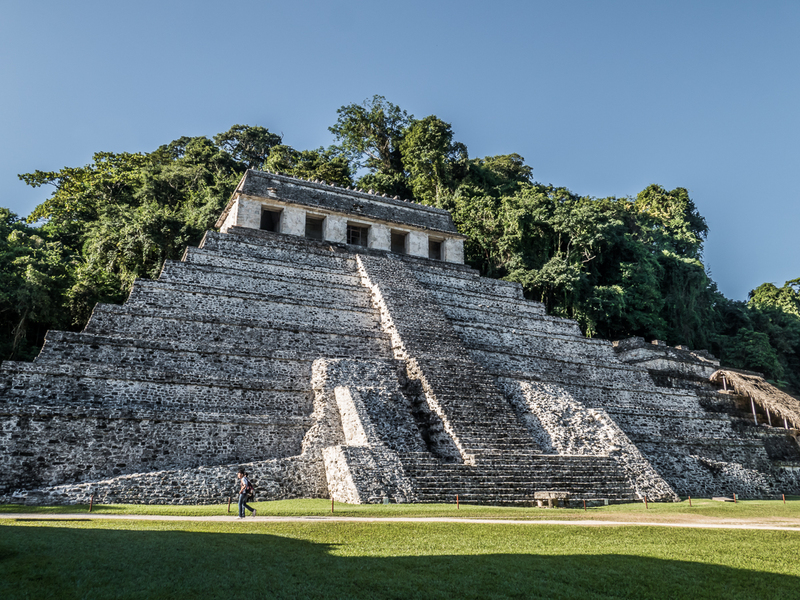 The last site we visited was Palenque, a Mayan city-state that flourished in the 7th century. It is estimated that less that ten percent has been uncovered. The rest has been consumed by the jungle. 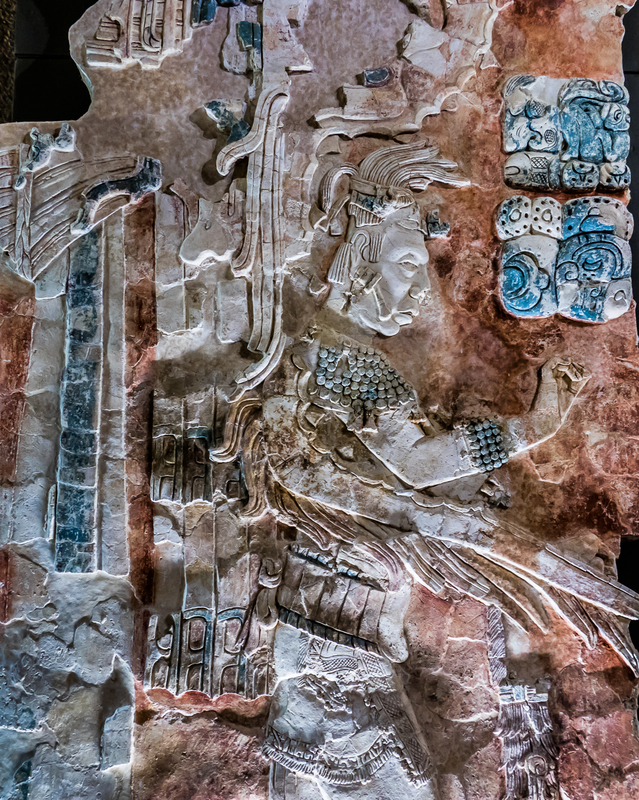 Temple of the Inscriptions, containing the tomb and sarcophagus of Lord Pakal the Great. with its unique astronomical observation tower. 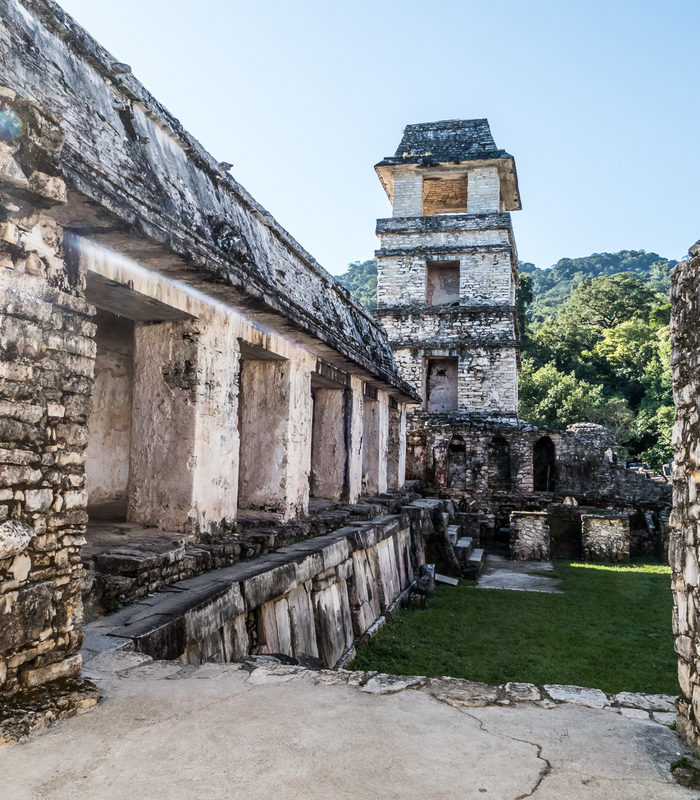 There is also a ball court at Palenque. A very different legend about the players in the rubber ball game is described here: that they were prisoners and the members of the losing team were all executed. Now that’s motivation for you! 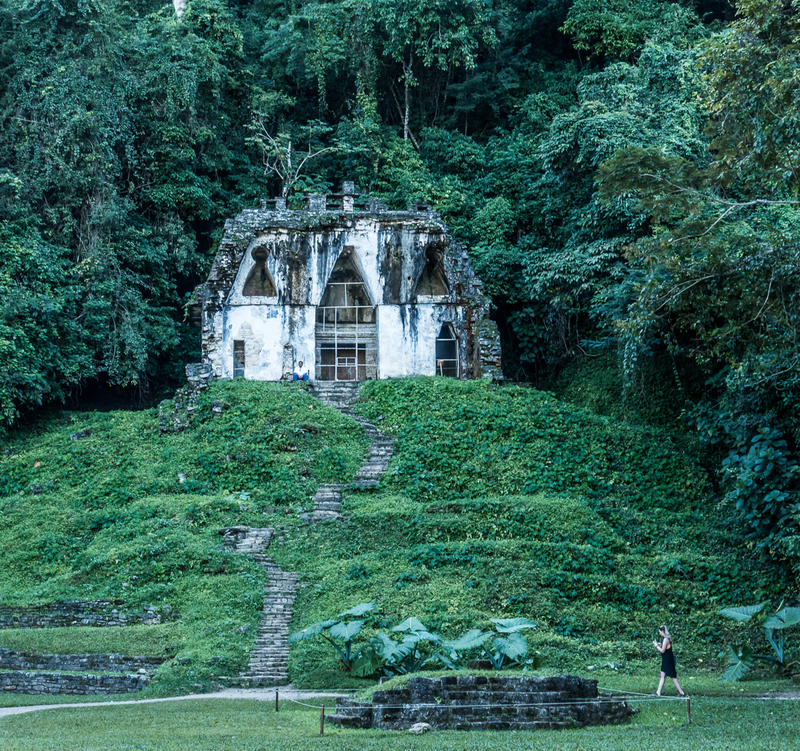 to a secondary exit that is very close to the Museo de Sitio de Palenque. This museum is a gem: the exquisite jade masks, relief carvings, and ceramic effigies are beautifully displayed in glass cases. 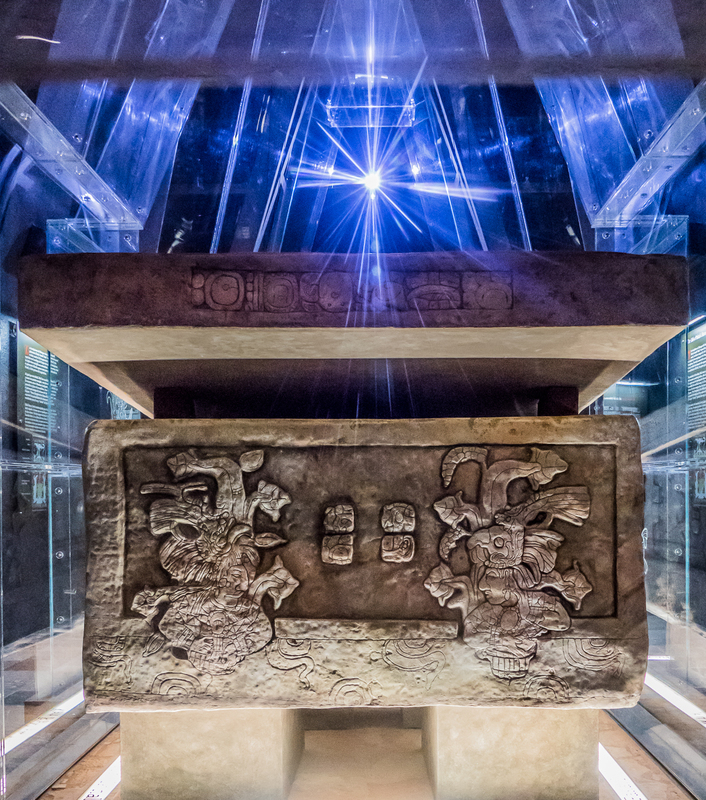 There is also a full-sized replica of the enormous stone sarcophagus from the tomb of Lord Pakal The Great. Overall this relatively small museum is much better curated than the far bigger Gran Museo del Mundo Maya in Merida. I experienced a deep silence at each of these sites. Each of these cities was inhabited for a thousand years or more, and it seemed to me as if the spirits of the former inhabitants were still peacefully present, despite, or perhaps because of, the history of human sacrifice. Next post: Yeah Campeche! – one of our favourite towns, and oh well . . . . . Villahermosa. Tomorrow we go to Guatemala for two weeks and then to Cuba for two weeks. Internet access may be erratic. wonderfully told, Don & Alison. Hi David, Don here. My apologies for not responding earlier: when I saw two comments under your name I mistakenly thought that Alison had already replied to you – oops! Anyway, thank you for your comments. We are very glad that the days of human sacrifice were long over when we visited these ancient sites. We’re not planning any trips into the USA in the immediate future – the cost of travel medical insurance for visits to the USA is becoming prohibitive for me now that I’m in my 70’s. Such a pity, because there are so many beautiful and interesting places to visit in your country. I love your posts and photos! Spectacular, honestly. I’ve been to Chichen Itza would love to visit those other sites. I do find it inconceivable that the world hasn’t fulfilled the restoration of the vast majority of those sites covered by the jungle. I had this same feeling in Peru at many wonderful historic sites. That’s how I started following you, after visiting Chincheros and later finding your post about it. All so beautiful and informative. I wish I could travel as much as you! Come visit me in Hawaii! Hi Joe, Don here. So pleased to hear that you’ve been enjoying our posts. We’d love to visit you in Hawaii, but given the way your new president has been behaving we’ll just have to take a rain check for the time being :). Thanks Anita, Don here. 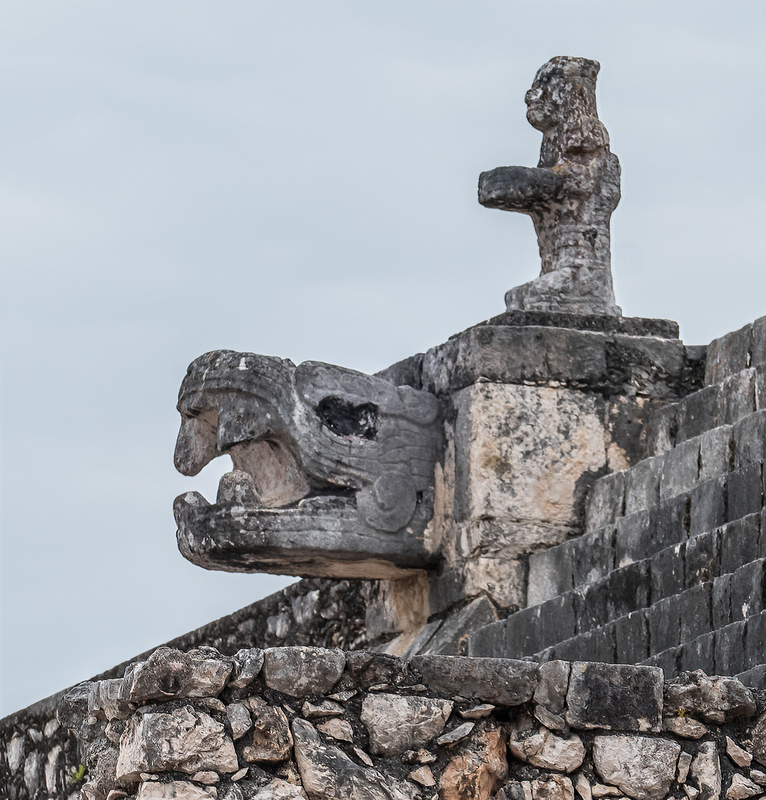 I’m jealous that you hiked the Mayan ruin trail all the way from Tulum to Comalcalco: we just haven’t been fit enough for long hikes for some time now, so we just take a taxi or a colectivo to the sites and walk around from there. We didn’t think to include one of us in our photos of the Olmec heads to give the scale. In retrospect it would have been a good idea. We have got “ruined out” from time to time, Rome being the major example, but that didn’t happen this time around. The world really is an amazing and awesome place, and the vast majority of people we meet on our travels are friendly and helpful. Seeing people’s faces light up in Spanish-speaking countries when we wish them “Buen dia” or when we walk past them in a restaurant and wish them “Buen provecha”makes our day too. Oh, and I was so impressed! Me gusta Mexico mucho tambien. Incredible places, Don! Amazing what we have created and then discarded along the way, isn’t it? I usually do some research before I visit, but often forget things and have to look it all up again afterwards. It falls into place then. The research is kind of a trigger for what I might see. So much to love in this post. That incredible house with the steps? A little hideaway 🙂 Safe travels! Your photos are amazing. I would love to be able to see the ancient ruins in Mexico someday. Hello Jen, Don here. Thanks for the feedback about the photos, all but a couple of them were taken by Alison: she has the photographer’s eye. 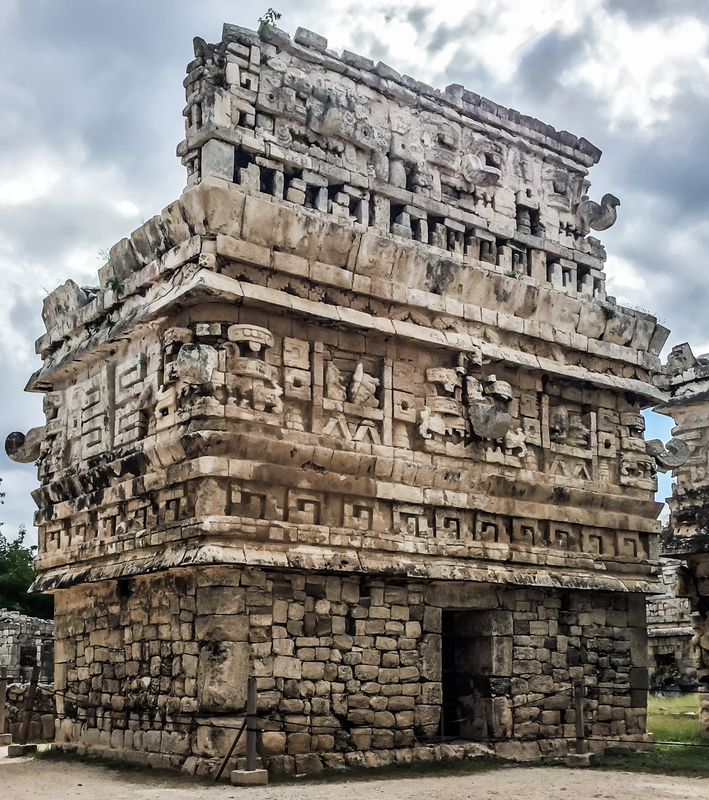 The ancient ruins of Mexico are well worth a visit. I hope you get there some day soon. 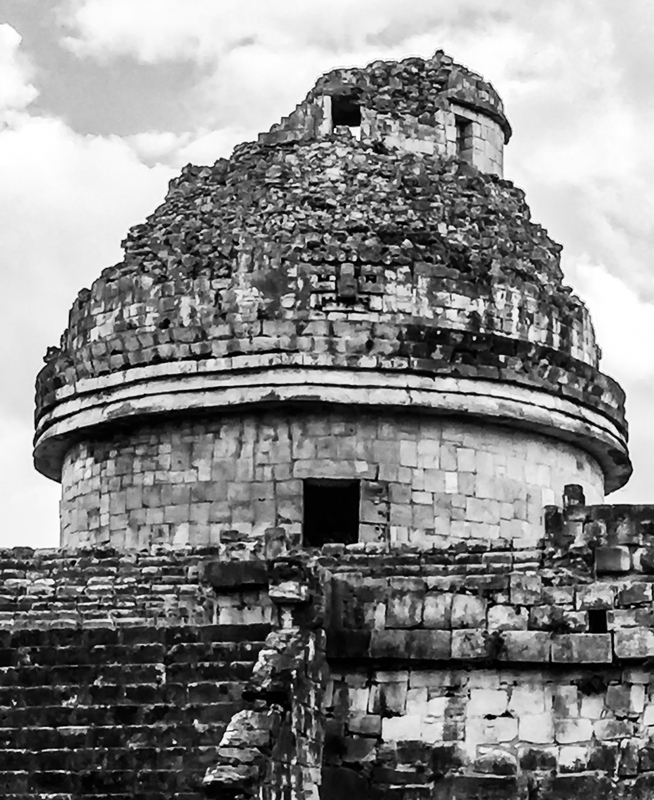 This is the third or fourth blog post about Mayan pyramids and sites that I read in the past three days. As a person who loves ancient structures, Mexico has been high on my wish list for quite some time now. It’s so far away from where I live, but I know a trip there would be unforgettable. 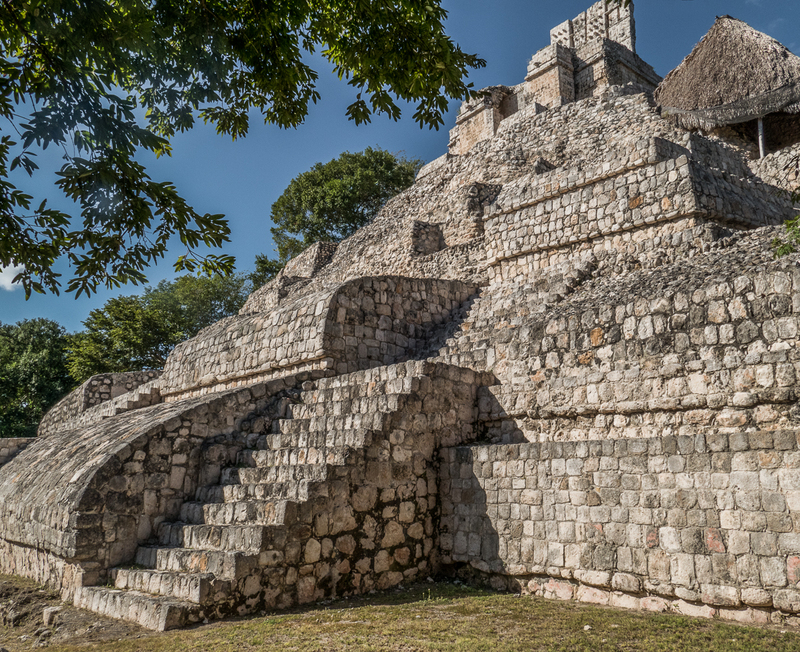 Thanks for introducing us to less-known places like Ek’ Balam and Edzna, Don. I wonder if one of these nights I’ll dream of the Olmec giant heads, or being in the middle of a Poc-a-Toc game. Hey Bama, Don here. 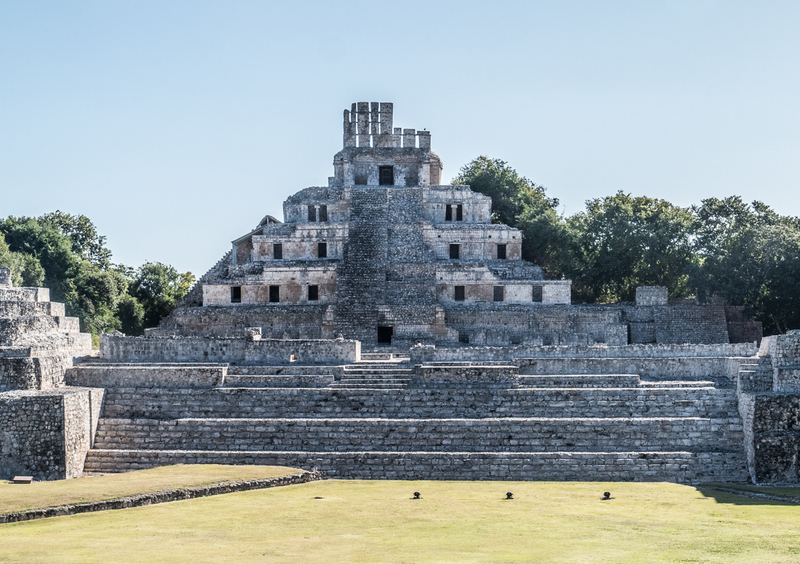 Mexico is astonishing, with amazing ancient ruins, including Teotihuacan, which is very close to Mexico City, but the Yucatan is outstanding for its ruins. 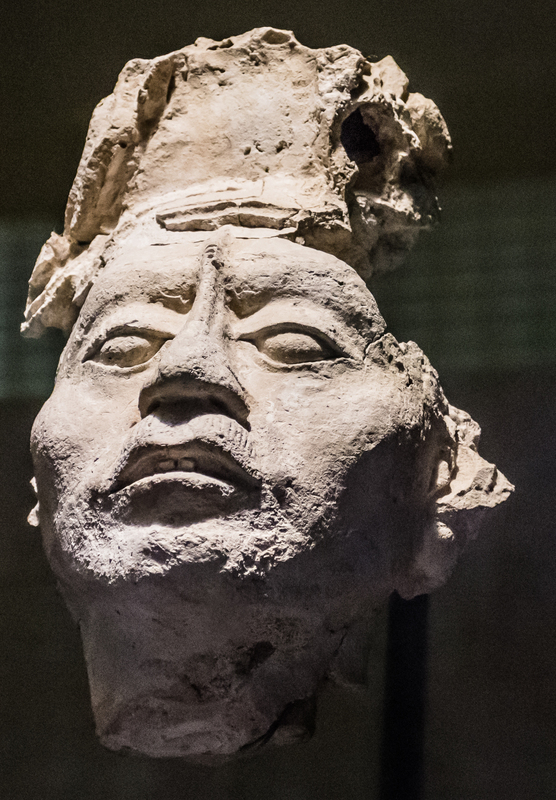 Having seen a modern example of an Olmec head on a young man in San Cristobal de las Casas, it’s quite possible that one could show up in your dreams. 🙂 Personally I wouldn’t want to find myself in the middle of a Poc-a-Toc game – way too deadly for my liking! What a thorough post! I really like the photo of the mysterious long walk into the jungle, the observation tower and the first museum figure with the beak. I too enjoy reading about history after a visit, because for me it gives more meaning via context and I am more likely to remember some of it…hopefully. Hi Peta, Don here. Thank you so much for your comments. 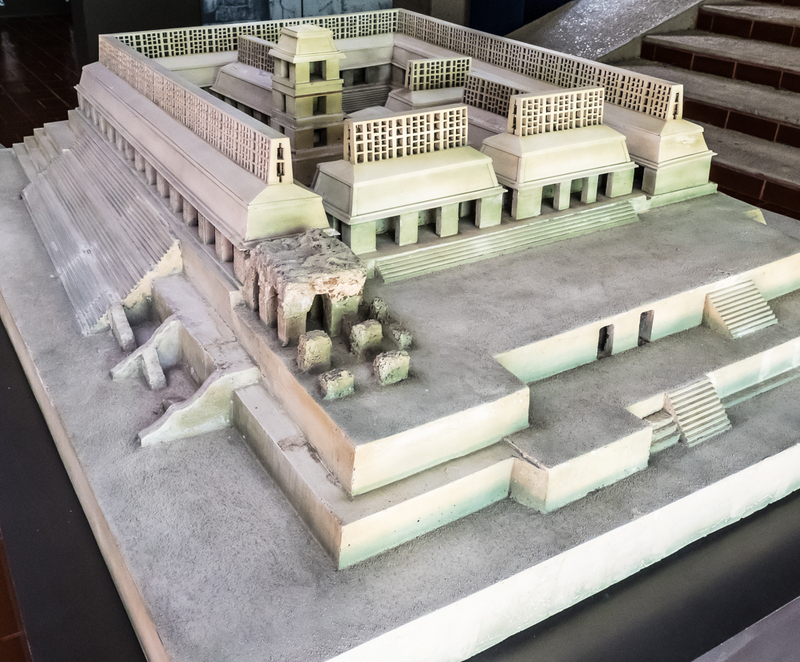 Palenque was a real highlight for me both because of the buildings and the outstanding museum. With all of the travelling we do much of what I experience doesn’t stick in my memory, but then I’m probably older than you :). Awesome post! I’m planning a trip to Mexico this summer and stumbled upon this blog by chance… I’m inspired! Hello Eva, Don here. Glad you enjoyed this post. Hope you have a fabulous visit to a wonderful friendly country. The photos are wonderful and all but transported us there… thank you so much — it’s always best to view places like this in solitude if possible…. 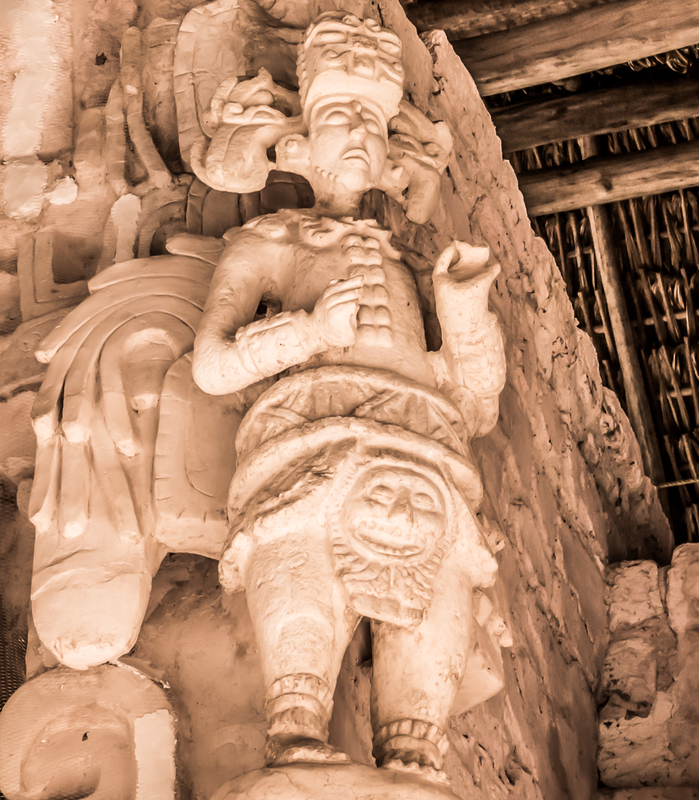 in the book Sastun, the authorRosita shares that the shaman told her that the good spirits had left Tikal because of too many visitors..
you are ‘on the money’ about the former inhabitants lingering there… i’m so glad that you experienced that comforting ‘deep silence.’ ahhhhhh. Hi Lisa, Don here. So pleased to hear that you were transported to Mexico by the photos. Getting to each of these sites early in the morning made all the difference to our experience of them. The silence just rings when there are hardly any other people around. 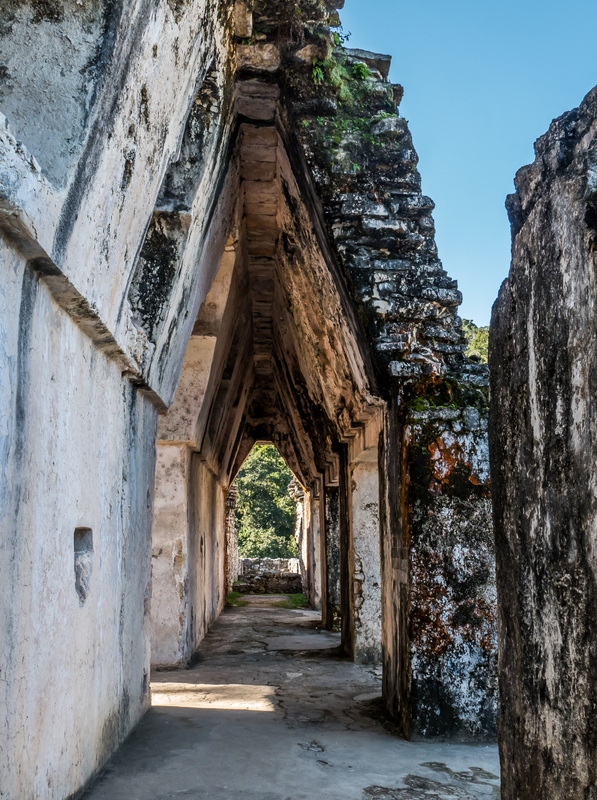 I’m sad to hear that the good spirits have left Tikal because of all the visitors. Chichen Itza was filled with visitors by the time we were leaving, but the spirits still seemed to be very present to us. Oh happy travels you two! Enjoyed seeing these photos and we have visited some of these too. Thanks Sue. We’re now out of Mexico and have just arrived in lovely Guatemala: more new adventures. 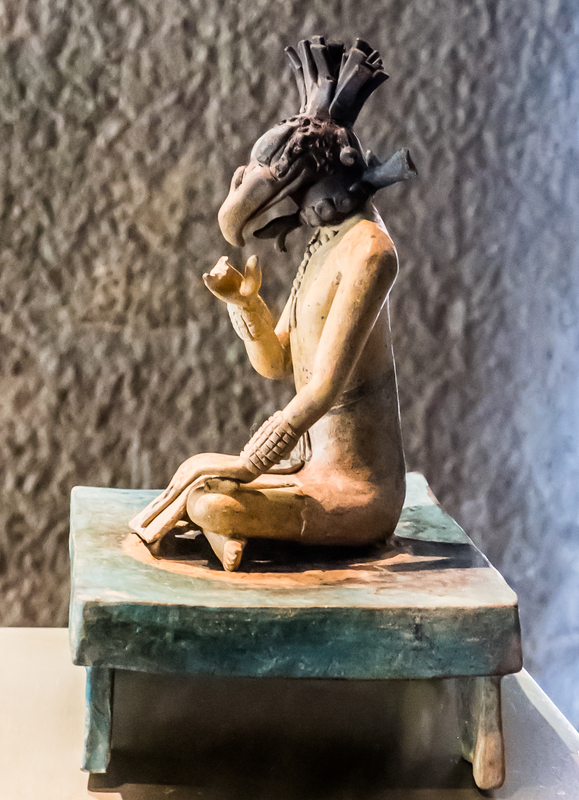 Loved especially the photos of the Palenque museum artifacts. Thanks Angeline. It was a really good museum. This trip looks amazing ! Hi Beata, Don here. Thank you for your kind comments. Thank you a lot. And I invite to follow my blog if you like travels. I really like your blog – good job ! Great post. I am like you, I can’t be bothered to research too much in advance but afterwards I am intrigued and read more. It makes more sense then. Those cities are incredible – I’d love to go back in a time machine and see them in their prime. Thanks Jeff. I’d love to go back in a time machine too, but would probably not want to wander into a game of Poc-a-Toc n case I lost my head. Good for you for stepping off the beaten track to go to the smaller sites where you can feel even more powerfully the mystique of these places. Although it makes things more inaccessible, I have always found the “swallowed up by the jungle” ambiance part of the thrill! Hi Lexie, Don here. Glad that our post brought back some good memories for you. 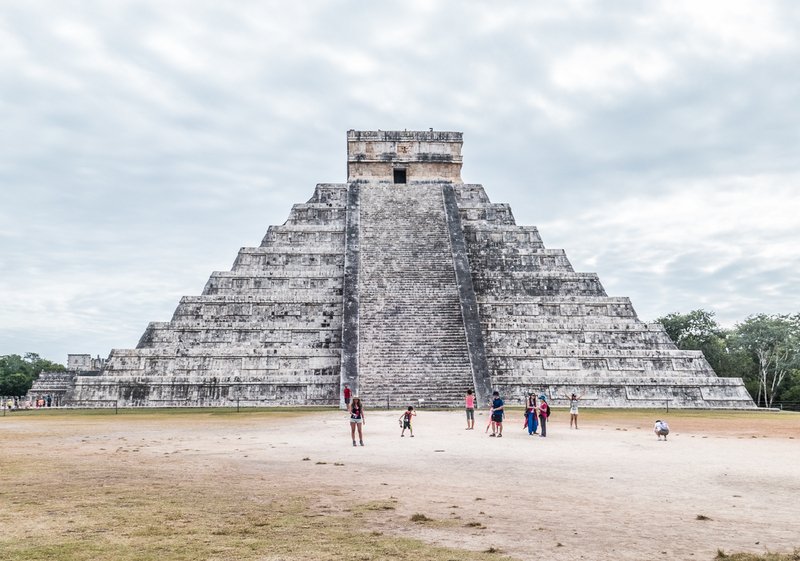 They don’t allow anyone to climb the pyramid at Chichen Itza any more – it must have been quite a climb for the two of you! Sorry for the delay in responding – Alison just found your comment in her Spam file. Thank you very much for your kind thoughts. Fascinating article superbly illustrated. Thank you Don and Alison. Happy and safe travels. Thanks so much Isabella. It was amazing seeing the remains of this once great civilization. Amazing post! So nice to see some of the lesser known sites that are not so popular with tourists. I’m working on a post about some Buddhist caves in Mumbai and I’m struck by the fact that the caves in India were being inhabited during just about the same time period as the ruins you’ve shown here. Love your closing thought about silence and spirits, too. Safe travels to Guatemala and Cuba! Thanks Kelly and J, we liked the less-well-known sites because they were so quiet. I’m wondering whether the Buddhists in the Mumbai caves were as sophisticated as the Maya? We’re currently in lovely San Pedro La Laguna on the shores of Lake Atitlan: three volcanos around the shores. Alison’s friend has lived here for eight years, and knows many of the indigenous families living in San Pedro, so we’ve a much more intimate experience of connection with these lovely and friendly people. Impossible to pick a favorite picture in this set. They are all so incredible. And yet, the one that grabs me the most is the one after the Temple of the Inscriptions. I’m a lot like Don, I think – I don’t deliberately research places anymore. I like to show up and soak it in, then buy a history book or two in the gift shop and learn more about a place after I’ve let it sink into my bones. Hi Felicity, Glad you enjoyed all the photos. The temple you liked most reminded me of a witches’ cottage with the greenery all around it. Don…I saw this post a while back, even read a bit. Didn’t have time to finish, never got back to it until just now. I’ve been a tad MIA lately. Work. And stuff. But LOVED this post. And of course, all the photos. Looks like Alison is doing a sort of painterly thing on some of these, eh? Cool. I admit, I love the photo of the little abode that looks like a house up a hill. I want to live there. But what spooked me the most was the photo of the statue, man with bird head. It reminded me of a statue I found at Teotihuacan (sp?) and bought from a rather shady guy. I don’t know if it’s real or not. But it has a jaguar coming out of his stomach. And a bird head similar to the one in your shot. If it’s real, it’s valuable, if not, it’s still a good story. Thanks for reminding me of that, and my Mayan trips. I saw a Mayan calendar in Guatemala that was round and taller than a human, maybe 10 or 12 feet high. But nothing like those heads you guys found!! They are cool. Nice to hear from you any time, and thanks for your kind comments. Remember, too much work . . . .
Alison does do painterly things with some of her photos, but she tells me, and I believe her, that she didn’t do any with the photos in this post. When I saw the little temple that looks like a house on a hill I was reminded of a witch’s cottage. I was just relieved that there wasn’t a couple of kids walking up the path or smoke curling up from the chimney. I thought the bird head looked like that of a buzzard or some other carrion eater. We’re currently in Antigua, Guatemala. 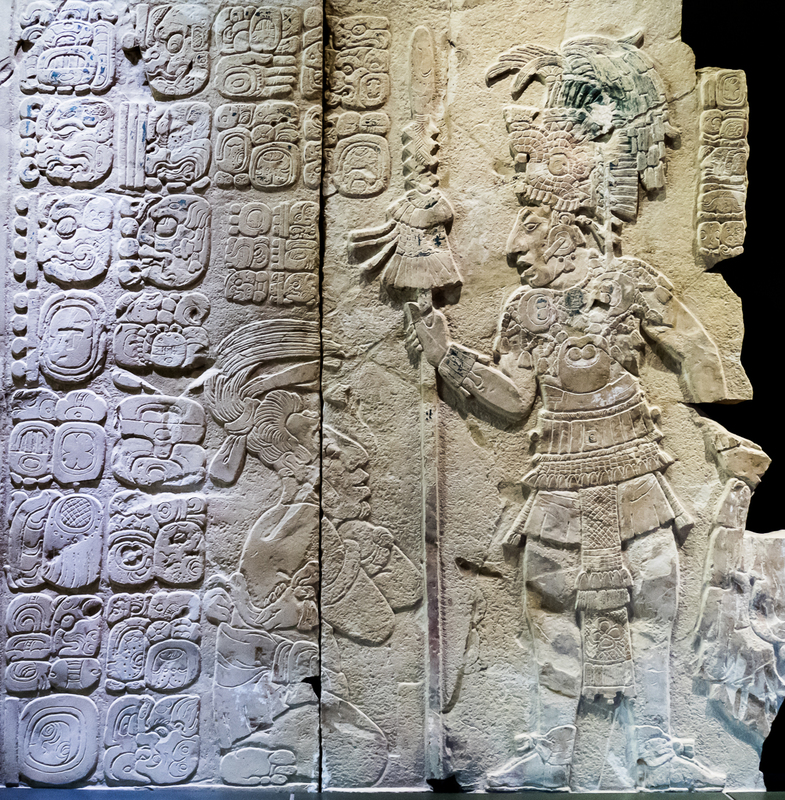 Do you remember where you saw the huge mayan calendar? We’re off for a couple of weeks in Cuba on Feb. 13, then back to the end of winter in Vancouver. Hope the snow has gone by then. So glad you enjoyed the post, and that it brought back some wonderful memories of your own Ruins Tour. It’s always the same, wherever we go, we can’t possibly see everything that’s there is to see, but we do our best with the time and the energy we have available to us. Hi Don, wonderful post and great pictures. I got to see some of the Maya Civilizations ruins at El Salvador and loved it. 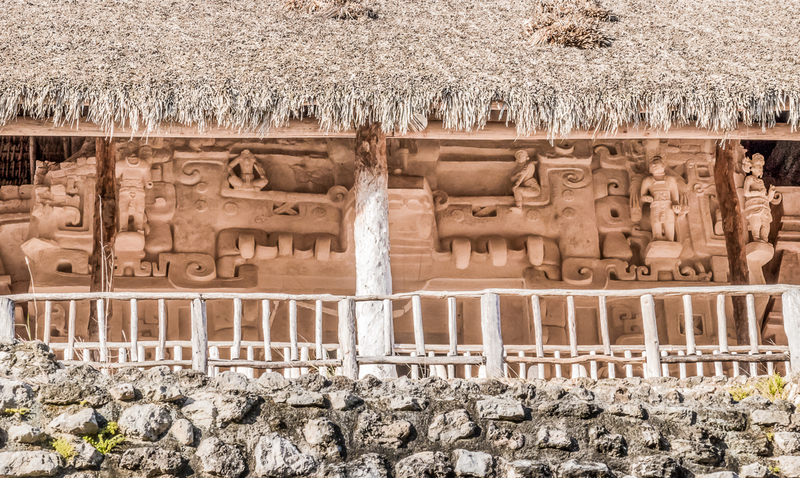 But yes, Gautemala and Mexico have far more well preserved sites. Hopefully, will visit them too! Hi, Thanks for the positive feedback. 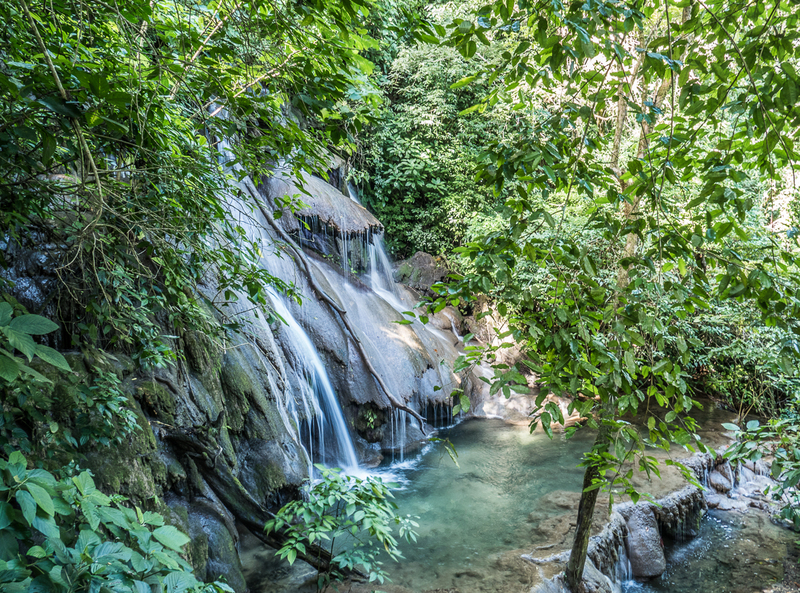 We haven’t been to El Salvador (yet), but who knows where our travels will lead us.